And looking at the gfs and access models for this morining, they are a fair bit out in their predicted centre, so not too sure these models will get it right until a defined LLC is defined and tracked. Im actually thinking looking at Nullschool watching the winds changing gradually there is a good chance it may split in two. 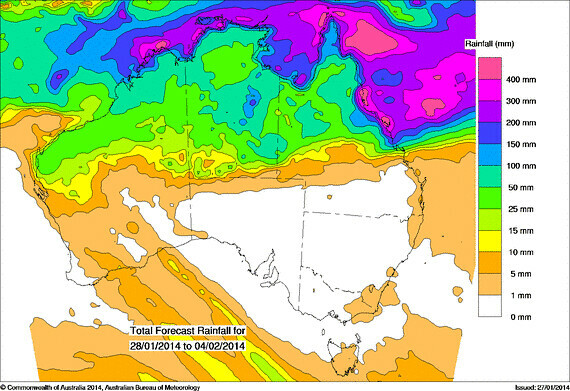 Central Coast and Whitsundays Forecast Districts. 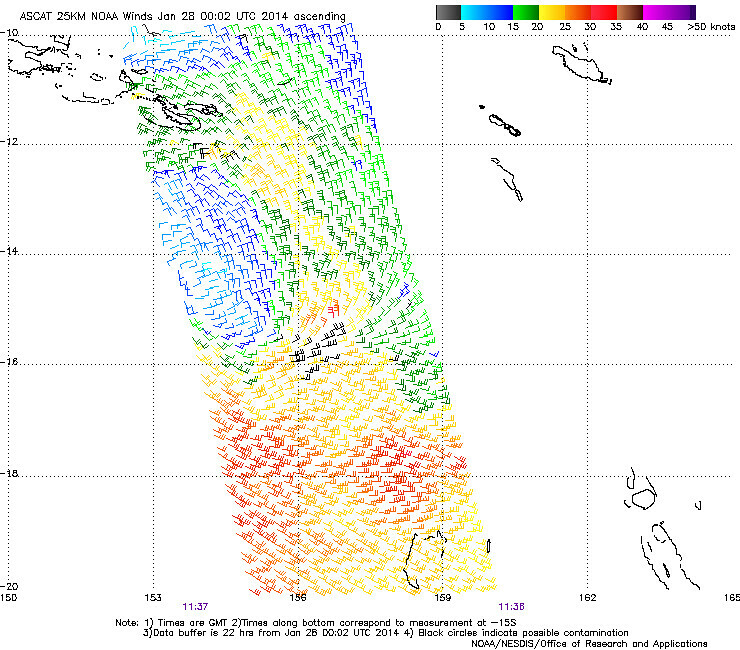 Issued at 10:34 am Tuesday, 28 January 2014. Synoptic Situation: At 9am, a tropical low was situated in the northern Coral Sea, approximately 870 kilometres east-northeast of Cairns, and moving southwest at around 10 kilometres per hour. The tropical low is expected to move in a general westwards direction over the next couple of days and may develop further as it approaches the Queensland east coast. The potential for the system to develop into a tropical cyclone will be assessed during today and Tropical Cyclone Advices will be issued if required. Heavy rain, which may lead to flash flooding, and damaging winds, with peak gusts in excess of 90km/h, are expected to develop about coastal and adjacent inland areas between Port Douglas and the area north of Mackay during Wednesday afternoon. 24 hour rainfall totals in excess of 200mm are possible. Water levels on the high tide are also likely to exceed the highest tide of the year about coastal areas between Port Douglas and the areas north of Mackay over the next couple of days. Locations which may be affected include Hamilton Island, Proserpine, Bowen, Townsville, Cairns, Port Douglas and Mareeba. The next warning is due to be issued by 4:35 pm. Looks to be dropping down South? Hmm ok, having seen the other thread I'm obviously looking at the wrong system. So the low dropping south off Cairns, is that a potential cylcone, depression, anything? Did it branch out off the low above it? 870km ENE of cairns @ 10km/h equates to *possible* landfall around 87 hours / 3.5 days. At this rate, there is time to get organised and deepen. Plenty of time for it to bomb if it wants. Seems the BoM are making out there should be a cyclone advice tonight. this low has some size to it. I am looking to the in-feed in the NE quad to fire up and then the NW quad to wrap into NE quad. Is that a bit of rotation on Satellite Visible, cant see it on Infrared but can see some on Visible I am sure. can someone have look and confirm or deny for me please. 24 HOURS, ALLOWING THE SYSTEM TO QUICKLY ORGANIZE AND CONSOLIDATE. Love that description by jtwc. They are seemingly confident. so ...... . they say no development ? yep, seems to contradict JTWC's latest as per 'Steamy' above. Thats best scenario we can hope for really. Lots of rain and less distructive winds is just what the doctor ordered. Farmers out west will be pleased. Generated in 0.041 seconds in which 0.014 seconds were spent on a total of 13 queries. Zlib compression disabled.